Have you got any wooden plugs that you have used a few times and written off as useless because they do not do what you want them to? Don't leave them forgotten in a drawer, get the tools out and start turning them into lures that will work for you. You may be horrified by the thought of mutilating ten quid's worth of plug, but face facts, if you don't use it, it is just firewood. First though, you have to have a plan. Before you take the plunge and decide to change things, are you sure it needs changing? I have been surprised at times to find that a plug that I had written off suddenly comes into its own, a change of venue, a change of rod, or seeing someone else using one successfully can alter your perspective dramatically. And just because you do not like the action, give it a chance,let the fish decide, a lure that works differently to your preferred action might be the only one that will catch on a given day, because all your other choices are too "samey". But if you are certain that a change is needed, on a quiet day take your "failed" plug or plugs, and give it a thorough try-out so that you are sure you understand how it works, and what you would prefer it to do. Make notes if you have more than a couple to assess, it is easy to forget important details. At home check the attitude of the plug in a bucket of water, does it sit nose-down, nose-up, or horizontal? Remember to clip on a wire trace because the weight of a trace can make quite a big difference, especially if you are trying to achieve neutral , or nearly neutral buoyancy. Do you want to change its attitude? Again make notes if necessary. The most frequent change that you will want to make is to the buoyancy of the plug, either adding or subtracting lead to change the running depth. First you have to find out where the lead is now. You will need to sand off the paint from the plug and examine it to either see the lead, or the filler that shows where the lead is. Use a medium grade sandpaper, take care not to rub away the wood, just take enough paint off to find the lead, usually the lead will only be in one or two places. Wrap extra lead around the hooks to until you work out how much you need. I find that I usually add slightly too much lead so I usually add a couple of big splitrings to the plug when I am testing it, then I can remove them if necessary when I have finished or leave them in place where they can do no harm. Removing lead is easy, you will see that the lead will have been inserted into holes drilled into the body of the plug. Use a drill bit of lower diameter than the existing lead fill and drill into the lead. Don't go mad, but if you do remove too much you can easily add it again. Test the plug in the bucket again, remember the hooks, splitrings and wire trace. On the subject of hooks, the size and wire thickness will be important, especially if aiming for neutral buoyancy. Adjust the amount of lead until you think it is right. After it has dried fill the remaining hole with wood filler, and simply paint the whole plug in white primer. This process is ongoing, if you do not like the result you can simply make another adjustment. You can learn a lot about lure design from this process, and gain confidence in buying cheaper plugs, knowing that you can modify them if they do not suit you. Adding lead to plugs can be a little more complicated, you can quite radically alter the action, which may not be what you want to acheive. Again sand the paint off and have a look at the position of the existing lead, if there is any. If you do not want to fundamentally alter the action or attitude of the plug there is a simple rule, keep the lead central, as near as possible to the centre of balance of the plug. I doctored this Rapala Supershad, adding about 12g of lead altogether. I tried to keep the extra weight as close to the centre of balance as I could and the result was a success. Even in the temporary colour scheme this has caught pike when the regular Supershad didn't. It runs deeper than the standard and rises a lot more slowly on the pause. I did another version, aiming for neutral buoyancy, adding more lead in roughly the same place. The action was more or less unaffected but the running depth was transformed - I lost it on a snag in 12ft of water! The SSR is a very good candidate for experiments, the design is so fundamentally sound that it takes some radical alterations to stop it performing. Learning how to blend these additions to precisely tune your plug is not difficult, but you will not master it overnight. The shape of the plug will have a big bearing on exactly how much lead you use and where it goes. The most useful size of drill bit is 5mm to 8mm, with experience you can hold the plug in your hand and drill it, but it is easier to keep everything straight by clamping the plug in a Workmate, or a vice with something to protect the plug from the metal jaws, say a couple of small pieces of plywood. Try to keep the drill at rightangles to the cross-section of the plug, although it may be useful to angle the drill towards the head or tail. One problem with some wooden plugs is a one piece through-wire for the hook hangers and trace attachment. This obviously restricts where you can drill, but does not stop you completely. You are only likely to be able to drill partly into the body before you find the wire, go gently, and stop when you reach the wire. You should not do any serious damage to the wire. If adding lead high up you will have to drill matching holes from either side. Getting the holes to match up can be tricky, but you do not need to be that precise, within a millimeter or two will be fine. It is best to mark the wood with a bradawl or a sharp nail to guide the drill, larger bits will skid sometimes, if drilling balsa or other soft woods, go gently, it is easy to enlarge the hole unintentionally. You can buy roofing lead from builders' merchants, this is thin sheet, very convenient and a few pounds will buy enough to last a very long time. I cut the lead into thin strips, then roll it into cylinders, trimming to match the diameter of the drilled hole. Then poke it into the hole, it should be a snug fit. If adding lead into paired holes roll the cylinder and cut into halves so each side gets the same weight of lead. Try to keep additions even and central, but you can only be roughly accurate, don't worry too much, imbalances have to be quite large before they make any practical fishing difference. Sometimes the changes you want to make do not involve buoyancy. This section describes the sometimes subtle and sometimes radical techniques you can use to modify your plug. Have you ever noticed that a plug stops wobbling when a strand of weed catches on a hook? If you have a plug that wobbles too fiercely you can calm it down by adding a trailer grub, either to a treble hook or to a specially added eye. Experiment with the size of the tail and its position. A spinner blade can add a little extra something to a plug. The position, size and shape of the blade is critical. Placed at the rear it might dampen the action of the plug as well as encouraging fish to strike at the blade and miss the hooks. Placed at the front it might change the attitude of the plug, the line will always try to make a straight line to the blade, so the plug's	tail may sit up. Too large a blade will provide too much torque and twist the plug sideways or even upside down, and the weight of the blade will reduce the plug's bouyancy at rest, although paradoxically reduce the running depth. It is generally best to add a new eye for the blade attachment swivel, beware of the blade actually masking the hooks. In general the idea of a spinning blade on a plug sounds great, but the limitations are considerable, my own experiments have not produced any great advance in fish catching ability but I suspect there might be applications for perch fishing in particular. 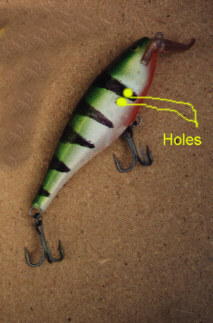 With a smaller plug, adding anything often improves its catching ability simply because the addition makes it bigger. If you examine your plugs you will see a variety of trace attachment positions, and might notice that the lower the trace attachment eye, the wilder the action. You might be able to add a screw-in eye to give you a choice of attachment positions. Screw eyes are no good for soft woods like balsa, but you can sometimes fix them on plastic plugs, if in doubt - don't! The size, shape and angle of the diving lip will have a major bearing on your plug's action, if it has a	metal lip you may be able to bend it. Try bending it gently, keeping it	straight, and see if you can get an action you like. If you bend it too	much or too often you may break it off, so be careful, although you may decide to replace the lip anyway. Remember that any such changes are irreversible, so think before you act. Another idea to try is reducing the size of the lip, a hacksaw will deal with metal or plastic, use a file to smooth it off, and take care to leave it symmetrical. Conversely you could try increasing the lip's size by shaping a new lip	from aluminium and glueing it to the original. I have caught fish using	a Rapala Supershad thus modified, but eventually the new lip will break off, it needs a more permanent fixing. The simplest modification I have left until last. Paint your plug, I have transformed some hopeless plugs into real favourites with a lick of paint. I think this might be because a plug in its new livery leaves behind its past failings, and perhaps I am more determined to catch on my own colour scheme so I try harder. I am quite happy now buying plugs in any colour, taking advantage of bargain prices on unpopular patterns, knowing that I can repaint them in my favourite colours. Whatever colour scheme you choose, here are some guidelines to painting your plugs. Avoid oil-based enamel paints, these are incompatible with almost everything else, and the lacquer is not clear enough. I use acrylic paints, the brushes wash out in water, and you can use car-type spray paints on top as well as nail lacquers without any reaction. I am no painter, if I want stripes I use a permanent marker pen and draw them in, be careful with pens because the ink often changes colour when the lacquer is applied, although sometimes this effect is desirable. I use clear nail lacquer as the final coat, this will make the marker pen run a little if used carelessly, I spray some car type lacquer on first which helps to seal the marker pen. There are some terrific nail lacquers available now which allow you to create some neat effects, I do recommend, though, that you send your daughter or wife to pay for them to avoid funny looks in the shop. No matter how you protect your plug, the paint will come off, the hooks will scratch a circular furrow and hopefully pike will punch big holes through your beautiful paint job. I try to patch up the plugs and maintain the colour scheme as well as I can, after all, if the pike like it, why let it deteriorate? In any case, dry the plug out and recoat it in clear nail lacquer to preserve its buoyancy, fill any big holes with wood filler or Araldite. Once you have tried a few alterations and enjoyed a few successes as well as endured a few failures, your level of understanding of plug design will improve considerably. Some of your expensive pieces of firewood will start catching fish and you will look at all your plugs in a new light.